Herbert Bock: It is all rubbish isn't it? I mean... transplants, antibodies. We manufacture genes. We can produce birth ectogenetically. We can practically clone people like carrots, and half the kids in this ghetto haven't even been inoculated for polio. We have established the most enormous medical... entity ever conceived, and people are sicker than ever. We cure nothing! We heal nothing! The whole goddamn wretched world, strangulating in front of our eyes. George C. Scott is amazing, just terrific as a struggling, aging, world-weary doctor. A couple of the speeches he gives (from the sharply written screenplay) are first rate quotable stuff. See this movie for him alone. Overall, this is certainly a New Hollywood movie, straight out of the late 1960s politics and sexual revolution. It's also a bit of a middle-aged male fantasy (the director and writer and main actor being of course all middle aged males). I mean, a key line in the movie is when young and slightly batty Barbara, played by Diana Rigg (Emma Peel in the television series "The Avengers"), says to the very middle aged George C. Scott, "I have a thing for middle aged men." Or something to that effect--and you know what happens next. But that's the weakest part of the movie. The best part is the hospital scene itself, the chaotic and scary lack of medical professionalism at an under-funded big city medical center. Scott plays the chief of medicine, Dr. Bock, and he gradually sniffs out a truly murderous element to the place, a kind of whodunnit built into this otherwise growing drama of doctors inside and protesters outside (usually) and a general sense that the old order isn't able to keep order against the rising restlessness of young people and their demands. In a way, the flakiness of Barbara and the rock-steady but yet suicidal authority of Bock are symbolic of the two sides, the two generations, that signified so much back then. Barbara suggests dropping out and turning on, and the doctor grows to the idea. I mean, who wouldn't in his shoes, having Diana Rigg begging you to leave your miserable job and life and moving to the mountains of Mexico to make babies. That's no exaggeration--that's the carrot, and the doctor sees it the way many people saw it then, the escape as a reasonable alternative to a crumbling world. And yet, the hospital has needs, like dying people, and a group of people displaced from their apartment building next door, and of course this murderer on the loose. In a way, it's a sloppy, terribly constructed movie. But it has an element of abandonment and realism from the era that really works. 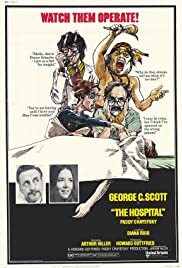 If you just go along with the superficial parts of the plot, which are fun, you might just get sucked into the tawdry medical world in 1971 Manhattan. The director, Arthur Hiller, moved from 1960s television to movie directing and made a lot of middling fare, though a few became well known such as "Love Story" (1970) and "Man of La Mancha" (1972). The cinematographer Victor J. Kemper is straight out of New Hollywood and his style feels beautifully unpolished and complex (he went on to do a lot of solid movies, some really terrific like "Dog Day Afternoon"), and this helps hold the disparate plot elements together.